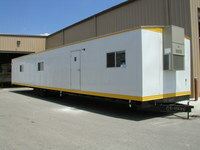 Construction Units | C&B Modular Inc.
We build sizes from 8x20 to Multi-Plexes custom designed per your specifications or we have standard units that are set up to meet most of your construction site trailer needs without you having to make up the specifications. We can email some of our standard plans so for you to review and add or delete from to suit your needs with minimum work on your end. Please note the standard Floor Plans listed below.